Cottman Glass & Mirror is the leading Horsham mirrors installation company providing mirror installation, mirror repair and mirror replacement in Horsham, PA. For over 50 years the professionals at Cottman have been installing, repairing and replacing mirrors for residents in Horsham, Pennsylvania and the surrounding area. We have the experience and skill necessary to provide custom mirrors in a wide variety of shapes and styles. Whether you’re looking for polished edges, beveled edges, modern mirrors or antique mirror designs, we can shape and customize them to fit many applications. Our staff is careful, neat and personable, with the necessary materials and hardware to handle any job. We can also supply the necessary installation materials and hardware for those with the skill to install themselves. At Cottman, we work with some of the best decorators and design houses in Horsham, PA and the surrounding area. Whether you live a contemporary lifestyle or are looking to reflect your traditional tastes, our mirror installers can bring your imagination to life. Each of our professionals offers the finest craftsmanship for mirrors and is Horsham’s leading residential and commercial mirror installation company. We offer unique options while monitoring every detail of the project, from design to installation. We keep up-to-date with the latest in beveled and antique mirrors, and provide only the highest quality in materials. When you need a mirror installation company in Horsham, PA, contact Cottman Glass & Mirror for options that match your style. Everyone’s style, space and budget is different. This makes each of our clients’ jobs unique, and we’re here to serve everybody. We have served many customers from Horsham, Pennsylvania and offer in-shop orders, in-home design consultations, delivery, as well as on-site installation. We pride ourselves on excellent customer satisfaction and creating the look you will love for years. Our staff will work closely with you to determine exactly what you’re looking for so we can exceed all expectations. If the installation is intricate or you have any questions, our craftsmen are readily available to answer them for you and alleviate any concerns. In addition to a friendly, professional staff, when you contact us you will receive a completely free consultation. We will determine what you’re looking for and provide an accurate estimate up front, so you won’t have to worry about any hidden fees. We believe that upfront honesty with our clients leads to long-term business relationships and will not be satisfied with the work until you are. We can work within any budget restrictions you have and, if we’re installing your mirrors on-site, we can work around your schedule for your convenience. When you’re looking for Horsham mirror installation services and need a company that will prioritize your needs above all else, contact Cottman Glass & Mirror and we will help you see what’s best for your space. 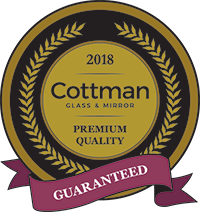 If you’re looking for custom Horsham mirrors or need a new custom mirror installation, replacement or repairs in Horsham, PA 19044, give Cottman Glass & Mirror a call at (215) 784-9505 or contact us to request a free consultation.